It is not intended for use in actually riding or navigating any of Moab's mountain bike trails. 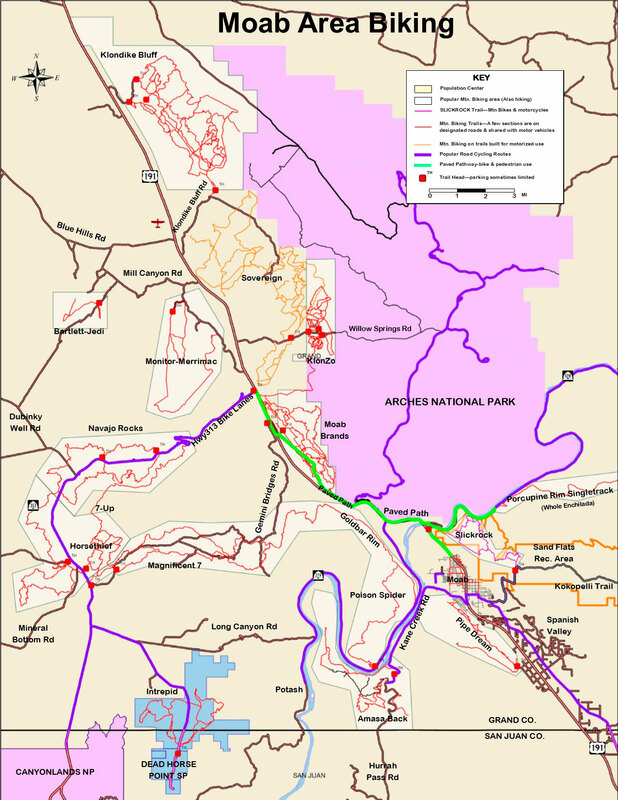 The Moab Trail Alliance publishes detailed maps of each trail system and copies are available for $2.00 at most Moab bike shops. Moab has over 150 miles of singletrack mountain bike trails within easy reach of the main population center. The average rider could spend an entire week in Moab and ride from a different trailhead each day without repeating. From Klondike Bluffs in the north, Navajo Rocks and Dead Horse Point in the west, to the Slickrock Trail in the east, Moab has an abundance of trails to explore. Most trail systems are very well mapped, with signs at major trail intersections showing your current location on a map of the area with individual trails color-coded for skill level required. A general note on the trail rating system: Moab trails are often a degree more difficult than many visitors are accustomed to. Green, Blue, and Black ratings are relative grades. In Moab, some green or blue trails may be more challenging than the green and blue-rated trails back home. Be sure to bring enough water. Many people, unaccustomed to the low humidity, underestimate how much water their body needs in Moab's dry air and higher elevation. It is advisable to not rely solely on digital maps, but to bring a paper map, too. 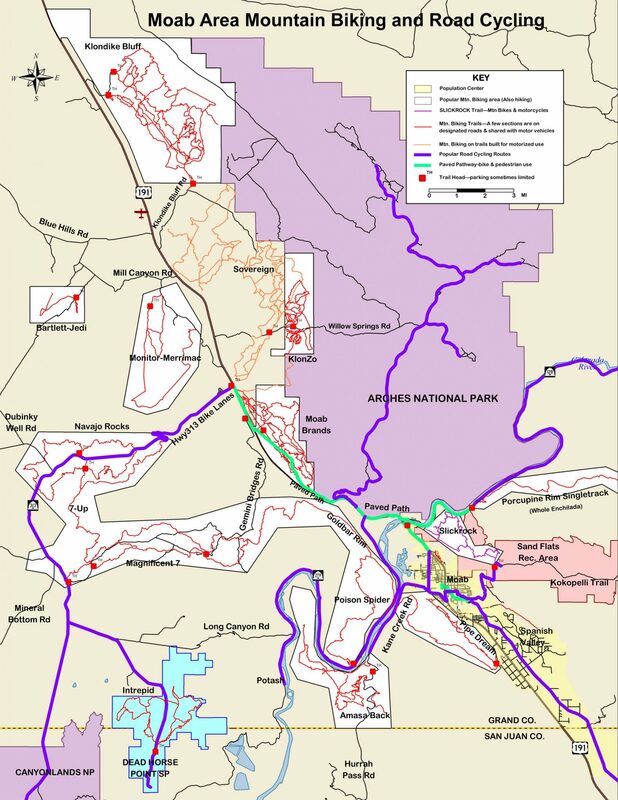 Cellphone coverage often is sporadic or disappears altogether on Moab's trails, and even GPS connections can be blocked in the canyons. For more info call (435) 259-8825. Thank you to Moab Area Travel Council for use of their map.